In August 2015, the Central Bank of China chose to devalue the national currency, the Yuan, by nearly 4%. The currency of the world’s second largest economy dropping so abruptly sent reverberation which were felt in China and around the world. This paper, consisting of information available through early September 2015, will first explain the RMB devaluation. Second, it will illustrate how the exchange rate for the RMB is set by the Chinese government. Next, it will analyze the former peg rate used by the Chinese government in the days before the Chinese economy was liberalized and more exposed to market forces. Then, the paper will go on to explain the currency conundrum, China’s competing interests in maintaining both a stronger and a weaker currency. Next t be addressed will be, how the drop in China’s currency affects the Yuan becoming an international currency. This is followed by an analysis of the poor economic indicators leading to the drop in the Yuan. Afterwards, the paper will discuss both the realized impact and predicted impact the Yuan drop will have on the Chinese, Hong Kong, and then foreign economies. Finally, the political reaction to the Yuan devaluation will be discussed. From 2005 through the August, 2015 devaluation, the RMB was no longer pegged to this government peg rate. Instead, the currency has been able to float in a more market driven scenario, with the value floating within a narrow range of 0.5% around the central parity published by the People’s Bank of China. (Ding) After the devaluation in August, the Chinese government said that they will liberalize the exchange even further, allowing market forces greater influence on the value of the Yuan. Another potential issue for China is that the central government wants to increase the use of the Yuan as an international exchange currency. In fact, China has been campaigning to have the IMF recognize the Yuan as a reserve currency. (Cendrowski) The IMF maintains a basket of reserve currencies, called Special Drawing Rights, the composition of which it reviews every five years. The most recent review took place in 2010. (Imf.org) With the next review planned for 2015, the Yuan will have to meet several requirements if it is to be included. The Yuan must be proven to be “freely usable,” or widely used to make international payments and widely traded in foreign exchange markets. (Lange) “Freely usable” in IMF terms means that the currency is widely accepted in international trade. (Imf.org) China must demonstrate that the Yuan is strong, stabile, convertible, and that the value is market determined. But at the same time, China wants to maintain a competitive edge on exports. Some of these goals could best be achieved through a strong Yuan and others through a weak Yuan. U.S. stocks fell, as did commodities which China is a significant importer of, such as copper and oil. There was much speculation that the Yuan devaluation was a sign that the Chinese economy had slowed and that demand for raw materials would remain low. (MAKINEN and MASUNAGA) The US Dollar has been strong recently, making US export products less attractive. A dropping Yuan makes the Dollar-priced products even more expensive, which could result in decreased demand for US products. At the same time, Chinese products have become even cheaper in the US which may hurt domestic sales of US products. “Some analysts worry that China’s devaluation may be exporting deflation around the world.” (MAKINEN and MASUNAGA) Many reports used the term “currency war” as there were fears that countries would begin devaluating their currencies to compete with China. At the same time, manufacturers in other countries may cut prices for goods sold overseas. The reduced income, plus the cheaper products from China could drive prices down further, causing deflation. While some experts believe that the devaluation of the Yuan will have very little net impact on the US, they believe that it may have a great impact on other countries who have China as a significant trading partner. The devaluation may force other countries, such as Australia, Malaysia and South Korea to devalue their currency as well. While the drop impacted those currencies immediately, a larger drop in the Yuan and the consequent impact had already been predicted by some experts, prior to August. “an analysis by Morgan Stanley in March predicted that a 15 percent drop in the yuan, much larger than today’s move, would cause a 5 percent to 7 percent drop in other Asian currencies.” (Mullaney) This multiplier effect, if true, could be very worrying, particularly if the Central Bank allows the Yuan to drop further. Ashworth, David. ‘How Did The Yuan’s Devaluation Impact Indian Equities? – Market Realist’. Marketrealist.com. N.p., 2015. Web. 10 Sept. 2015. BBC News,. ‘What The Yuan Devaluation Means Around The World – BBC News’. N.p., 2015. Web. 4 Sept. 2015. Bhattacharya, Saugata. ‘India And The Devalued Yuan: The Good, The Bad And The Ugly’. Quartz. N.p., 2015. Web. 4 Sept. 2015. Bloomberg Professional service,. ‘China’s RMB Devaluation: Economic And Industry Implications | Bloomberg Intelligence, Foreign Exchange | Bloomberg Professional’. N.p., 2015. Web. 4 Sept. 2015. Cendrowski, Scott. ‘Here’S Why China Devalued Its Currency’. Fortune. N.p., 2015. Web. 4 Sept. 2015. Ding, Yuhao. ‘How Do Currency Pegs Work? How Does The Chinese Government Peg The Renminbi To The Dollar? – Quora’. Quora.com. N.p., 2015. Web. 4 Sept. 2015. Euromoney.com,. ‘China: Special Focus @Euromoney’. N.p., 2015. Web. 4 Sept. 2015. Fast FT,. ‘China’s RMB Devaluation In Context (Spoiler: Big)’. N.p., 2015. Web. 4 Sept. 2015. GOUGH, NEIL, and KEITH BRADSHER. ‘China Devalues Its Currency As Worries Rise About Economic Slowdown’. Nytimes.com. N.p., 2015. Web. 4 Sept. 2015. Herman, Steve. ‘Asian Currencies, Stocks Drop On Yuan Devaluation’. VOA. N.p., 2015. Web. 4 Sept. 2015. Hu, Zoe. ‘Q&A: China’s Yuan And A Potential Global Currency War’. Aljazeera.com. N.p., 2015. Web. 4 Sept. 2015. Imf.org,. ‘Factsheet — Special Drawing Rights (Sdrs)’. N.p., 2015. Web. 13 Sept. 2015. Imf.org,. ‘IMF Survey : IMF Work Progresses On 2015 SDR Basket Review’. N.p., 2015. Web. 13 Sept. 2015. Inman, Phillip, Martin Farrer, and Fergus Ryan. ‘China Stuns Financial Markets By Devaluing Yuan For Second Day Running’. the Guardian. N.p., 2015. Web. 4 Sept. 2015. Joiner, Alex. ‘Examining The Vietnamese Dong’. Anz Economic. N.p., 2006. Web. 7 Sept. 2015. Kicklighter, John. ‘What Does Yuan’S Devaluation Mean For Chinese And Global Markets?’. DailyFX. N.p., 2015. Web. 4 Sept. 2015. IMF.org ‘Factsheet — Special Drawing Rights (Sdrs)’. Imf.org. N.p., 2015. Web. 13 Sept. 2015. Lange, Jason. ‘IMF Freezes Benchmark Currency Basket, Defers Any Yuan Addition’. Reuters. N.p., 2015. Web. 13 Sept. 2015. Li, Sandy. ‘Retail Sector In Hong Kong To Suffer Most From Yuan Devaluation’. South China Morning Post. N.p., 2015. Web. 10 Sept. 2015. MAKINEN, JULIE, and SAMANTHA MASUNAGA. ‘Why China’s Devaluation Of The Yuan Matters So Much’. latimes.com. N.p., 2015. Web. 4 Sept. 2015. Mullaney, Tim. ‘5 Ways China’s Devaluation Could Shake The Markets’. CNBC. N.p., 2015. Web. 4 Sept. 2015. Patterson, Michael. ‘Malaysia’S Ringgit Heads For Worst Drop Since 1998 Amid Outflows’. Bloomberg.com. N.p., 2015. Web. 7 Sept. 2015. Pierson, David. ‘Products Made In China Often Cost More There Than In The West’. latimes. N.p., 2009. Web. 7 Sept. 2015. Powell, Rose. ‘Collateral Damage For Aussie As China Lets Yuan Slide’. The Sydney Morning Herald. N.p., 2015. Web. 4 Sept. 2015. Shaaw, Rajhkumar, and Kartik Goyal. ‘India Rupee Weakens To Two-Year Low As Stocks Drop On Yuan Slump’. Bloomberg.com. N.p., 2015. Web. 10 Sept. 2015. Sjolin, Sara. ‘What Yuan Move Means For September Federal Reserve Rate Hike’. MarketWatch. N.p., 2015. Web. 4 Sept. 2015. Smith, Patrick. ‘A Drop In The Value Of The Overpriced Yuan Isn’t Going To Spark A Currency War’. Business Insider. N.p., 2015. Web. 4 Sept. 2015. Spence, Peter, and SzuPing Chan. ‘Why China Has Devalued The Renminbi And How It Will Affect The UK’. Telegraph.co.uk. N.p., 2015. Web. 4 Sept. 2015. Sender, Henny. ‘Here’s Why The Drop In China’s Foreign Reserves Matters’. CNBC. N.p., 2015. Web. 7 Sept. 2015. Steinberg, Wei. ‘Cash From China Is Boon For Hong Kong’. WSJ. N.p., 2015. Web. 10 Sept. 2015. SWEENEY, PETE, and LU JIANXIN. ‘China Lets Yuan Fall Further, Fuels Fears Of ‘Currency War”. Reuters. N.p., 2015. Web. 4 Sept. 2015. USA TODAY,. ‘Yuan And You: How China’s Devalued Currency Affects U.S. Consumers’. N.p., 2015. Web. 4 Sept. 2015. Wei, Lingling. ‘China Moves To Devalue Yuan’. WSJ. N.p., 2015. Web. 4 Sept. 2015. WEI, Shang-Jin et al. ‘The China Money Puzzle: Will Devaluation Of The Yuan Help Or Hurt The Hong Kong Dollar?’. China Economic Review 11.2 (2000): 171-188. Web. Wildau, Gabriel. ‘Renminbi Devaluation Tests China’S Commitment To Free Markets’. FT.com. N.p., 2015. Web. 4 Sept. 2015. Yan, Sophia. ‘China’s Stock Market Continues To Free Fall’. CNNMoney. N.p., 2015. Web. 7 Sept. 2015. A friend sent me a Phnom Penh Post story about yutakhun khom the traditional Khmer martial art of Master Chan Boeunthoeun. In the article, Chan Boeunthoeun claims that his martial art is older and more authentic than the Bokator of Grand Master San Kim Saen. Chan Boeunthoeun has apparently gone so far as to solicit UNESCO to remove Bokator from the Intangible Cultural Heritage, martial arts list, in favor of his yuthakhun Khom. The whole argument is preposterous on so many levels. But before I explain how baseless this argument is, let me first say one thing. I have huge respect for Chan Boeunthoeun who taught his son Chan Rothana to combine traditional Khmer martial arts with bradal serey kick boxing, which Chan Rothana then used, successfully, in over 90 professional bradal serey kick boxing fights. Chan Rothana even used a combination of traditional Khmer techniques, plus bradal serey and some modern MMA to become a One FC fighter and to amass a professional MMA record of 3 wins and 1 loss. There should be no question about Chan Rothana’s courage, or the fighting effectiveness of his martial. He definitely walks the walk. And I respect that. But there is no evidence of any kind to prove that yutakhun khom is older than Bokator or that the word yutakhun khom even existed prior to 2012. Leading up to 2004, Chan Boeunthoeun used to be friends with Bokator Grand Master, San Kim Saen. They had both been part of the Hopkido federation and worked together to found the original Bokator Federation in 2004. They then had a falling out, and Chan Boeunthoeun left (or was asked to leave) the Bokator federation. Chan Boeunthoeun continued to teach Bokator out of his home until about 2012, when he suddenly decided that he was one of the two last remaining masters of yutakhun khom, which he claimed was the real Khmer traditional martial art. In 2012, The National Olympic Committee of Cambodia, working together with Grand Master San Kim Saen, managed to get Bokator recognized by UNESCO on the Intangible Cultural Heritage, martial arts list. 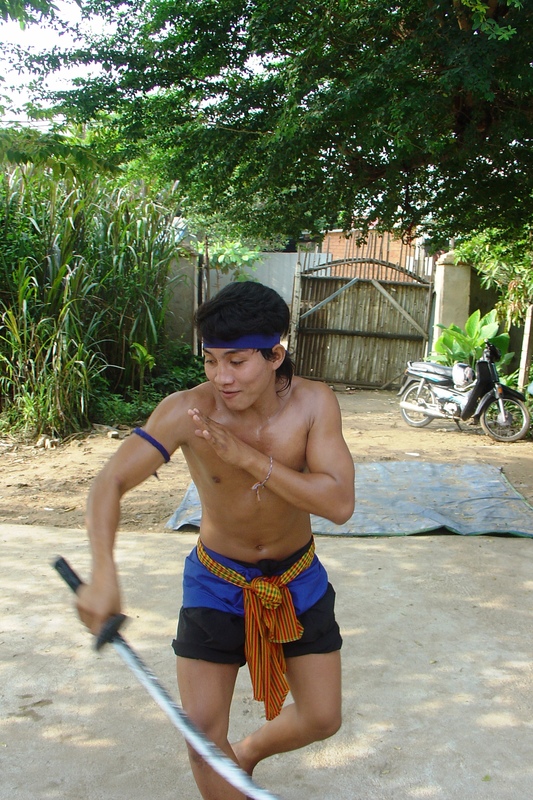 Before 2012, Cambodia had NOTHING on the UNESCO Intangible Cultural Heritage, martial arts list. Thailand had Muay Thai. Japan had Judo. Korea had Taekkyeon, but Cambodia had no official martial art until 2012, when the Bokator of Grand Master San Kim Saen was recognized. Since then, a number of other Cambodians have suddenly come forward, claiming to be teaching even older styles of Cambodian martial arts. In 2004, most of those masters, including Chan Boeunthoeun, were at the national meeting in Phnom Penh when the Bokator association was founded. Many of them were founding members of Bokator. So, if they actually knew of some other, older, better martial art, why did they wait until 2012 to talk about it? A Google search for “yutakhun khom” revealed the earliest online mention of the art was a post in a Sherdog.com forum in 2012. The Phnom Penh Post story had this quote from Benoit Rigallaud, the manager of Chan Rothana and owner of the studio where yutakhun khom is taught, “’UNESCO giving bokator Intangible Heritage Asset status was a concern to the yutakhun khom community, and should be to all Cambodians, because ‘they failed to conduct a full investigation”’” Full investigation! Of what? The only evidence yutakhun khom has is the legend of a magical book of the ancient martial arts techniques which was allegedly hidden for Centuries and then finally destroyed by the Khmer Rouge. Is it possible that someone who has a financial interest in yutakhun khom being recognized has a slightly biased opinion? And, when did opinion become fact? There doesn’t seem to be a shred of evidence to support the claims of yutakhun khom having existed. In fact the word does not appear in the 1936 dictionary of the Khmer language. Neither are there any ancient writings using that word, apart from the magical book which was destroyed by the Khmer Rouge. Another quote from Benoit Rigallaud, “This is crazy, because we are talking about history and culture here, and if heritage is lost then it is gone forever.” If Benoit Rigallaud and Chan Boeunthoeun succeed in getting Bokator removed from the UNESCO list, then Cambodia will be losing its cultural heritage. And I agree, that is crazy. As for the “history” of Bokator, I interviewed Chan Boeunthoeun, the first time, in 2007 in connection with the TV show, Human Weapon. At that time, Chan Boeunthoeun still called his style Bokator. He mentioned the book which had been destroyed as proof of the art. While telling me the history of Bokator, he told me that King Jayavarman VII, the patron of Bokator, and now apparently of yutakhun khom, and Bodhidharma (Da Mo) the founder of Shaolin Kung Fu, were “classmates.” According to Chan Boeunthoeun, Bodhidharma was Khmer, not Indian. Next, he said that King Jayavarman VII taught Bokator to Bodhidharma and Bodhidharma brought Bokator to China and called it Kung Fu. This story astounded me, given that Bodhidharma lived during the 5th and 6th Centuries and King Jayavarman VII lived during the 12th and 13th. When I asked him why history had recorded the story differently, he blamed Thailand. Those damned Thais and their political influence! They got the entire world to change the history of both India and China, just to repress the Khmer martial art of yutakhun khom. Chan Boeunthoeun’s story, since 2012, has been that he has been teaching yutakhun khom all along and that it was yutakhun khom that King Jayavarman VII supported and that it was yutakhun khom that was in the ancient book which was destroyed. According to the Phnom Penh Post story, “Boeunthoeun claims yutakhun khom dates back 2,000 years to the Funan kingdom of Southeast Asia, but it was King Jayavarman VII at the height of the Khmer Angkorian empire nearly 1,000 years ago who could be credited with cementing the yuthakun khom philosophy that survives to this day.”” This is the exact same story that has been told about Bokator. And, there is no evidence of either the word Bokator or yuthakun khom in any historical document in Cambodia. During the nearly ten years that I researched my book on Khmer martial arts, I also searched French documents. I searched in Thailand, Lao, and Burma. I spoke to Khmer martial arts teachers and students in USA, Australia, Canada, and Europe. And NO ONE had a book. No one had any evidence of any kind. And during those first many years, pre 2012, I never heard the word yuthakun khom. In fairness, I did here the word yuthakun used for martial art. And there was a yuthakun martial arts club that trained at the techno university in Phnom Penh. But their martial art was admittedly synthetic. They never claimed it to be original Khmer. It was basically a mix of everything from Khmer to karate, to taekwondo and even kung fu and probably judo. But not one person I interviewed, including Chan Boeunthoeun used the term yuthakun khom. Given the complete lack of evidence, it would seem more constructive for Khmer people to be happy that they made it to the UNESCO list at all. They should support the traditional martial art, whether it is called Bokator or yuthakun khom, and simply move on. There are so many other problems in the country which need to be addressed before tearing down work that has already been done and replacing it. Brooklyn Monk, Antonio Graceffo holds a black krama in Khmer martial arts. He is the author of the book, Khun Khmer: Cambodian Martial Arts Journey. He works as a lecturer at Shanghai University. He is also a PhD candidate at Shanghai University of sport, writing his dissertation on comparative forms of Chinese wrestling. He is expected to graduate his China MBA, from Shanghai Jiaotong University, and his PhD in Spring, 2016. Antonio is also a martial arts and adventure author living in Asia, the author of the books, “Warrior Odyssey’ and “The Monk from Brooklyn.” He is also the host of the web TV show, “Martial Arts Odyssey,” which traces his ongoing journey through Asia, learning martial arts in various countries. Army, U.S. ‘U.S. Army Employer Salary, Average Salaries | Payscale’. Payscale.com. N.p., 2015. Web. 1 Sept. 2015. Badenhausen, Kurt. ‘Average MLB Player Salary Nearly Double NFL’s, But Still Trails NBA’s’. Forbes. N.p., 2015. Web. 1 Sept. 2015. Bratcher, Jack. ‘“Strikeforce: Rockhold Vs. Jardine” Fighter Salaries; Lawler Top Earner At $150,000 | Pro MMA Now’. Prommanow.com. N.p., 2015. Web. 1 Sept. 2015. Cramer, Rob. ‘The World’s 10 Richest Boxers’. TheRichest. N.p., 2014. Web. 1 Sept. 2015. Fox, Jeff. ‘UFC Career Fighter Earnings – MMA Manifesto’. MMA Manifesto. N.p., 2015. Web. 1 Sept. 2015. Gaines, Cork. ‘CHART: The Average NBA Player Will Make A Lot More In His Career Than The Other Major Sports’. Business Insider. N.p., 2013. Web. 3 Sept. 2015. Gaines, Cork. ‘CHART: NBA Tops All Sports Leagues With Highest Average Salary For Players’. Business Insider. N.p., 2014. Web. 1 Sept. 2015. Gaines, Cork. ‘The 25 Highest-Paid NBA Players Of All Time’. Business Insider. N.p., 2014. Web. 3 Sept. 2015. Guerra, Tony. ‘Salaries Of Pro Boxers’. Work – Chron.com. N.p., 2015. Web. 1 Sept. 2015. Indeed.com,. ‘Mcdonalds Salary | Indeed.Com’. N.p., 2015. Web. 1 Sept. 2015. Iole, Kevin. ‘UFC Pay Is A Hot Topic, But Most Involved Feel It Is More Than Fair’. Yahoo Sports. N.p., 2013. Web. 1 Sept. 2015. Marrocco, Steven. ‘Ben Askren On Six-Figure ONE FC Fights, ‘Bald-Headed Fat Man,’ UFC Future, Baroni, More’. MMAjunkie. N.p., 2013. Web. 1 Sept. 2015. MMAjunkie,. ‘Bellator 106 Salaries: Champ Chandler Could Earn $190K, Alvarez $160K (Updated)’. N.p., 2013. Web. 1 Sept. 2015. MMA Sentinel,. ‘5 WTF Facts About UFC Fighter Pay’. N.p., 2013. Web. 1 Sept. 2015. Money.usnews.com,. ‘Auto Mechanic Salary Information | Best Jobs | US News Careers’. N.p., 2015. Web. 1 Sept. 2015. Money.usnews.com,. ‘High School Teacher Salary Information | Best Jobs | US News Careers’. N.p., 2015. Web. 1 Sept. 2015. Money.usnews.com,. ‘Patrol Officer Salary Information | Best Jobs | US News Careers’. N.p., 2015. Web. 1 Sept. 2015. Shmoop,. ‘MMA Fighter: Salary’. N.p., 2015. Web. 1 Sept. 2015. Symes, Kyle. ‘Askren Details ONE FC Contract’. Bleacher Report. N.p., 2014. Web. 1 Sept. 2015.